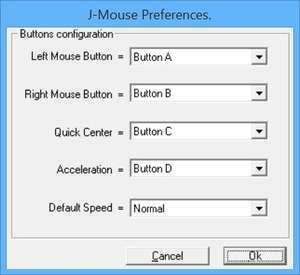 JMouse is a small and very basic utility tool which can assign the function of your connect mouse to a connected joystick or joypad. The program is rather dated but still functions fine on modern operating systems. Its usage is very uncomplicated and includes only a few different inputs for assigning controls. It can also adjust the speed of the cursor. For security reasons, you should also check out the jmouse download at LO4D.com which includes virus and malware tests. Additional screenshots of this application download may be available, too.